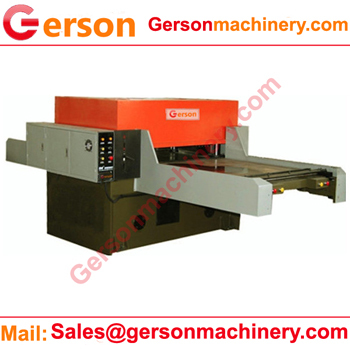 Double Sided Automatic Feed In Hydraulic Die Cutting Machine is front and rear sided (Or left and right sided) automatic feed in roll or sheet material die cut punching machine. 2.One side feeding the material and then cutting ,after cutting ,the material will return back to the side .And another side will feed material into the machine . 3.It can punch out any shapes because it work with the die molds which can amount the die under the beam or up on the table. 4. Four column press with double balanced yoke, self lubricated bushings and using top hydraulic system make sure high quality performace. 5.Gerson can design and manuafure the machine and dies molds for your production requirement.welcome to contact us any time.